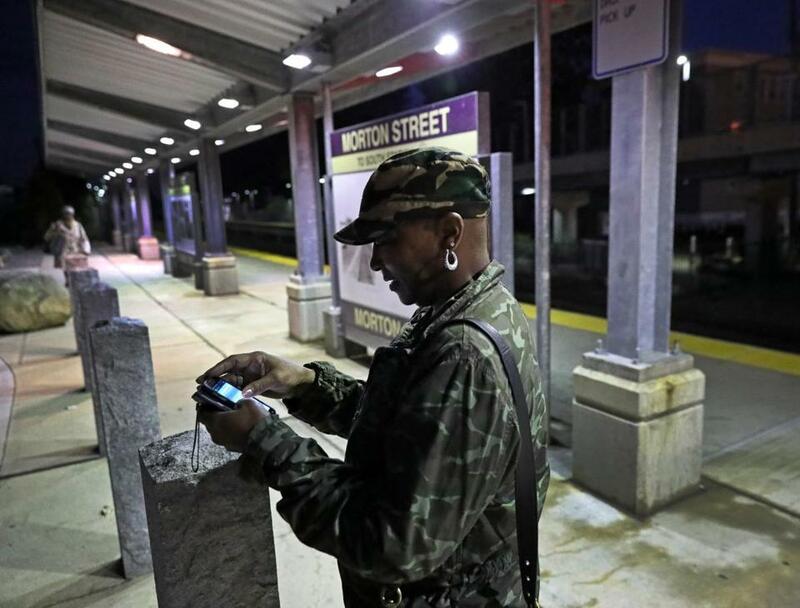 Bernadette Macon-Bell checked the train schedule in Mattapan. The Fairmount Line, which runs through Mattapan and Dorchester, has almost tripled its ridership since 2012, a finding public transit advocates hope will lead to greater investment in the often overlooked route. About 2,260 riders took Fairmount Line commuter rail trains on a typical weekday in 2016, up from fewer than 800 riders in 2012, according to a study released Thursday. Rebecca Koepnick, a senior director at the Boston Foundation, which financed the $50,000 study, said the findings show strong demand for the commuter rail line — the only one that runs entirely within Boston — and should persuade transportation leaders to provide more frequent trains. Fairmount Line trains travel through Dorchester, Mattapan, and Hyde Park, and serve many minority and low-income passengers. In neighborhoods without subway service, the trains represent a pledge from the MBTA to provide faster public transportation. But last summer and fall, Fairmount trains were frequently canceled, as the commuter rail operator, Keolis Commuter Services, shifted the trains to suburban lines with more riders. The reassignments infuriated riders and prompted US Representative Michael Capuano to call for a federal inquiry into whether the move violated customers’ civil rights. Federal officials say they have completed the investigation but have not made a final determination. Data released by Keolis in late 2016 showed that between July 2014 and November 2016, the line had 530 cancellations, far more than any other line. The cancellations declined significantly after the Globe reported on the disproportionate number of canceled trains. Keolis spokesman Tory Mazzola said the company aims to be an “attractive, reliable and convenient choice” for residents, and that the commitment includes the Fairmount Line. In response to the new study, Scott Hamwey, the state transportation department’s manager of long-range planning, said that transit officials are “very interested in continuing to work with our partners at the City of Boston to improve access to and from neighborhoods” along the line. From May 8 to 21, the MBTA will offer free rides along the line in an bid to boost ridership. Capuano said he hopes the free rides will draw more people to the Fairmount Line. “It’s all about trying to get more people off the roads and more people back and forth to work,” he said. Proponents have long argued that the Fairmount Line needs to run more often, and more reliably, to attract riders. The study, done in conjunction with Nelson/Nygaard, a Boston transportation consulting firm, found that many riders use the line to move among city neighborhoods, in contrast to commuter rail lines that primarily connect the suburbs to downtown Boston. “How do you increase ridership if you don’t increase service and it’s not reliable?” said Keith Mahoney, a spokesman at the Boston Foundation. Pamela Bush-Miles, a lead organizer for the Greater Four Corners Action Coalition who has long pushed for improvements to the Fairmount Line, said advocates were pleased by the findings, which bolstered their belief that the MBTA’s passenger counts had been too low. Miles, who rides on the line frequently, said the study shows a strong need for the service. She recalled meeting a grandmother who takes the train from Uphams Corner to Four Corners to see her family. “This is really a lifeline for people,” she said. The study recommends a range of improvements, including better bike lanes near stops, new bike-share stations, and potentially finding sponsors for the cost of additional service. Running one more train during peak hours would cost about $200,000 annually, the study found. State transportation officials say the MBTA has worked hard to increase ridership. The agency has spent more than $200 million to spruce up the 9.2 mile-line, opening three new stations in 2012 and 2013. They have also lowered fares to subway rates. Yet officials noted that far more people in Dorchester, Mattapan, and Hyde Park take the bus than Fairmount trains. Improvements to the bus system “may represent the fastest way to deliver needed improvements to residents,” Hamwey said. Rafael Mares, a vice president at the Conservation Law Foundation, a Boston environmental advocacy group, said both should be viable options. While the MBTA looks to make long-term improvements to bus service, the Fairmount Line provides a faster ride downtown for many residents.